The site of the present-day 60 Wall Street, a massive Postmodern tower completed in 1987, was partly a parking lot in the mid-1970s, when the city's fiscal crisis and the competition from midtown resulted in declining occupancy and real estate values on Wall Street and throughout lower Manhattan. The owner of the seven antiquated buildings that were demolished to make the site more attractive for new development was the oil company Cities Service, which had moved its headquarters to Tulsa, Oklahoma. In 2001, after a merger with Chase Manhattan Bank, J. P. Morgan sold 60 Wall to Deutsche Bank for $610 million. Following the terrorist attacks of 9/11, Deutsche Bank decided to use 60 Wall Street as its new North American headquarters. In 2007, the bank agreed to sell and lease back the building to Paramount Group Inc. for nearly $1.2 billion. 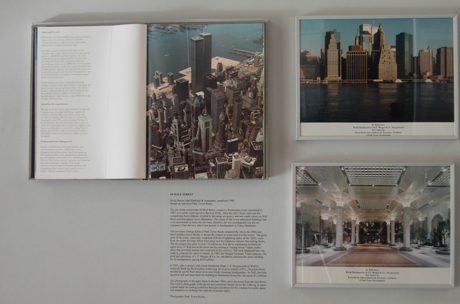 The photographs above, taken in the late 1980s, show the tower from the East River. The interior photograph of the atrium and pedestrian arcade shows the 2,360 sq. ft. space created under the zoning guidelines that gave incentives for the creation for public space and amenities in exchange for extra development rights. Wall and William Streets This series of photographs (above) shows the successive buildings that stood on the northeast corner of Wall and William streets, a site occupied by the Bank of New York for almost two centuries, from 1796 to 1988. Originally located in a private house at 48 Wall Street, the Bank of New York erected a four-story office edifice in 1858 designed by architects Calvert Vaux & Frederick Clarke Withers. The photograph at the bottom left shows the same building after alterations in 1879 by Vaux & Radford added a story and a mansard roof. At its right stands the elegant little 1873 building by Griffith Thomas built for the U.S. Mortgage Company. In 1927, the Bank of New York chose society architect Benjamin Wistar Morris to design a new 32-story building on the same narrow site. The limestone-clad setback tower telescoped to a slender spire crowned with a federal eagle, reflecting the bank's eighteenth-century origins, and the executive offices on the floors above employed the same classical style. 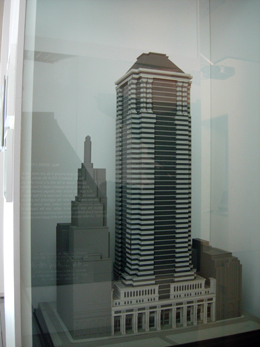 To its right, at the address 52 Wall Street, rose the slender slab of the National City Company Building, designed by McKim, Mead & White, demolished in the 1980s for the current 60 Wall Street. 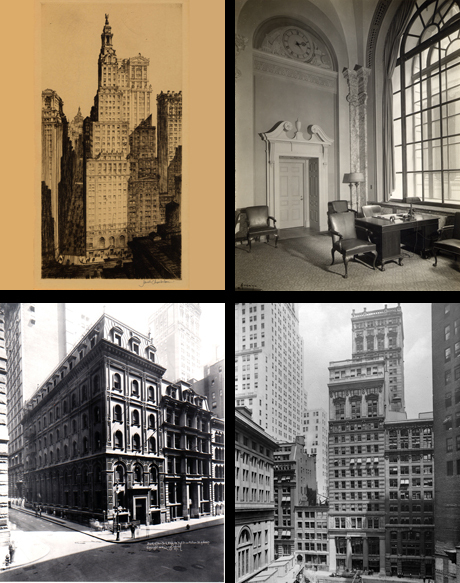 The photograph at the lower right captures the row of low-rise buildings of the early twentieth century that survived until the 1970s, to be replaced in the later 1980s by the imposing pile of 60 Wall Street, the model of which shown in this case.